by Ian Beavers, Analog Devices, Inc. There is a growing trend across the commercial, aerospace and defense SATCOM industry for increased signal bandwidth, processing gain and analysis. Wider modulation bandwidths are allowing SATCOM systems to satisfy the rapacious demands for increased data rates. At the same time, lower frequency legacy bands of C, L, and UHF will continue to be mandatory within some mission critical SATCOM systems to mitigate the impacts of atmospheric interference, such as rain fade, that affect the higher frequency bands. New state of the art signal processing and conversion solutions help make this revolution a reality. Many SATCOM systems now operate at the higher microwave bands of X- and Ku-, with a move toward Ka- bands. These help support wider modulation bandwidths, increased capacity, and benefit from a smaller antenna. Antenna size scales inversely with the square of the transmission frequency. Although Ka-band systems were previously known for consumer broadband applications, their use is now widening to enterprise and military solutions. With the addition of the higher band operating frequencies and bandwidths, a new set of challenges for RF design engineers is emerging for SATCOM systems. Ka-band systems are not just the next generation frequency band expansions to the lower speed Ku-band. Instead, they encompass a new type of satellite architecture with new transmission and bandwidth management to provide higher quality, better performance and faster data speed services to end users. Ka-band satellites typically implement wideband transponders that support wider frequency bandwidths such as 300-600 MHz, which is a ten-fold increase compared to 27 MHz-54 MHz Ku-band transponders. The downlink bandwidth of Ka-band requires a wider swath of spectrum than previously used in Ku- or lower frequency bands. Wider bandwidth transponders and higher bit-rate services require advanced modulation schemes in order to provide maximum carrier throughput. Modulation using 32 APSK, five bits/symbol, and other higher order advanced modulation will drive receiver system ADC requirements with higher dynamic range performance. In commercial solutions, a Low Noise Block Down Converter (LNB), part of the out-door unit (ODU), uses a low noise amplifier and down converter that is attached to the satellite feed. It is used for the downlink satellite transmission to convert a higher frequency to a lower frequency. The L-band is the result of the downconversion of the received downlink satellite signal, Ku- or Ka-band for example, from the LNB. Downstream of the LNB output, a second IF down-conversion stage has historically been needed to process the signal content within the L-band. A single AD9625, a 12-bit, 2.6 GSPS ADC, can directly digitize the entire 1-2 GHz L-band over a single Nyquist zone without interleaving artifacts. The AD9680, a dual channel 14-bit, 1.25 GSPS ADC, provides higher dynamic range and can digitize both I & Q within a 625 MHz Nyquist zone. Both ADCs have wide full power bandwidths and can directly sample beyond their first Nyquist zone for higher frequency bands of interest without the systems engineer needing to decipher an interleaving applications note. As Ka-band solutions do not support the requirements of all SATCOM system use cases, other lower frequency bands can also be used with similar architectures. For example, C-band continues to grow as an important band in industrial, military and many maritime applications where atmospheric interference can be detrimental to the mission. Independent of the downlink band that is used from a satellite, the down-conversion of 500 MHz or 1GHz of spectrum can be sampled by a single ADC. With signal processing capabilities continuing to increase unabated, more of the receiver signal chain is moving within the digital domain. As a result, the number of downconversion stages needed within the analog domain can be reduced in some systems. Digital processing downstream in the signal chain can then demodulate, tune and channelize the data for use in the end application. This allows the receiver more versatility to process several different bands of interest, with only a change to the local oscillator frequency and digital processing algorithm. Military Ka-band SATCOM terminals may currently employ multiple digital receivers in order to process signals in different channels. For example, four digital receivers, each with 125 MHz of bandwidth, may be needed to process a signal bandwidth of 500MHz. The multiple numbers of receivers increase the undesirable size, weight and power (SWaP) of a mobile SATCOM system. However, current state of the art ADCs can now process >500 MHz bandwidths with 12-bit and 14-bit performance without the negative side effects of interleaving spurs. Additionally, a 500MHz channel does not require 4 separate 125 MHz ADC receivers in order to process the same bandwidth. A dual channel 14-bit, 1.25 GSPS ADC can process both polarizations of the signal bandwidth. Figure 1: Wide ADC full power bandwidth allows the use of Nyquist bands beyond the 1st for direct sampling of higher frequency bands such as L-band. Band pass filtering of the unused Nyquist zones is mandatory to remove unwanted signal energy, outside the IF band of interest, that could potentially fold back into the 1st Nyquist, impacting dynamic range. Wider SATCOM bands require not only a larger observed bandwidth from a system ADC, but can also push the need for a higher full power bandwidth. In some applications, this can require the use of a higher order Nyquist rate band. Current generation GSPS ADCs allow GHz sampling well into the 2nd, 3rd and 4th Nyquist band with decimation options to get the dynamic range benefits of oversampling. If an ADC’s input bandwidth is high enough, it is possible to downconvert directly in the ADC by undersampling the IF signal of interest. In the case of a SATCOM downlink, the entire L-band can be digitized in fewer processing steps by presenting this signal directly to the ADC input. Higher bandwidth input signals and sample rates allow direct RF sampling of wider band signals and possible reduction of an entire stage in a signal chain for lower component count and simplicity. ADC undersampling is essentially the technique of using a sampling frequency that is less than twice the maximum frequency component in the signal. This technique can also be referred to as harmonic sampling, band pass sampling, or super-Nyquist sampling. To reconstruct the original signal perfectly from the sampled version, the Nyquist-Shannon Sampling theorem indicates that the sample rate must be twice the signal bandwidth of interest. This should not be mistaken with a sample rate that is twice the maximum IF frequency component. If BW is the signal bandwidth of interest, then a sample frequency of Fs > 2 BW is required. The signal bandwidth of interest can be between DC to BW or from A to B where BW = A – B. So long as the bandwidth of interest does not overlap an ADC’s Nyquist band, which is ½ of the sample rate (Fs), undersampling can work for higher signal bands with ADCs that have a high full power bandwidth (FPBW) relative to their respective sample rate as seen in Figure 1. Figure 2: Downstream of the LNB, a conventional satellite tuner with superheterodyne receiver (top) compared to a next-generation digital tuner with full-band capture using a wide bandwidth ADC (bottom). Today’s wideband ADCs offer systems potential for multiple wide Nyquist bands within an undersampling mode of operation. However, using a high order ADC Nyquist band to sample requires strict front-end anti-alias filtering and frequency planning to prevent spectral energy from leaking into other Nyquist zones. It also ensures that unwanted harmonics and other lower frequency signals do not fall into the band of interest after it is folded down to the 1st Nyquist. The bandpass filter (BPF) upstream of the ADC must be designed to filter out unwanted signals and noise that are not near the nominal bandwidth of interest. New GSPS ADCs such as AD9234, AD9680 and AD9625 offer multiple Nyquist band sampling with high dynamic range across wide input bandwidths. Since a direct sampling technique folds the signal energy from each zone back into the first Nyquist, there is no way to accurately discriminate the source of the content. As a result, rogue energy can appear in the first Nyquist zone, which will degrade the signal-to-noise ratio (SNR) and spurious free dynamic range (SFDR). Spectral issues can potentially plague government and military applications, both for sensing and communications. Several advantages are offered by direct RF sampling within front end designs. First and foremost, it can allow component count reduction, as can be seen in Figure 3, where an entire down conversion stage can be eliminated. It also removes the need to design a mixing chip to fit a uniquely tailored frequency plan. Second, it can simplify the design of next generation receivers for future signal bandwidths that become available as SATCOM systems are updated. All that may be needed to work with a new band frequency is to select an appropriate sampling rate based on the local oscillator frequency, and incorporate an appropriate band pass filter. Third, it is possible to make a single RF front-end suitable for multiple frequency bands. This approach to multi-frequency SATCOM receiver front end design eliminates the need for multiple frontends. Figure 3: The undersampling technique can potentially remove a downconversion stage as the L-Band input frequency is given directly to the RF sampling ADC. Current generation ADCs now offer a plurality of internal digital down conversion (DDC) processing blocks. Each DDC can apply its own decimation rate and numerically controlled oscillator for tuning placement within a Nyquist band. Processing gain can be achieved within a narrower bandwidth that digitally filters out-of-band noise. This reduces the required ADC output data and minimizes processing complexity in FPGAs and DSPs. However, additional channelizer signal processing can also be done downstream of the ADC. Wideband SATCOM systems require extremely high-speed data converters. State of the art GSPS ADCs such as AD9234, AD9680 and AD9625 not only offer high sample rates for a wider instantaneous bandwidth, but also the ability to sample high frequency inputs above the 1st Nyquist. 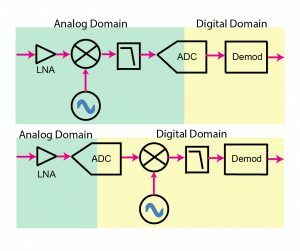 A single direct RF-sampling ADC used at a high bandwidth can potentially replace an entire IF-sampling or Zero IF-sampling subsystem of mixers, LO synthesizers, amplifiers, and filters while achieving greater flexibility. This can significantly reduce the system bill of materials (BOM) cost, design time, board size, weight, and power consumption. Ian Beavers is a product engineering manager for the Automation Energy & Sensors team located at Analog Devices, Greensboro, NC. He has worked for the company since 1999. Ian has over 19 years of experience in the semiconductor industry. Ian earned a bachelor’s degree in electrical engineering from North Carolina State University and an M.B.A. from the University of North Carolina at Greensboro.